President Moon Jae-in on Friday urged the Constitutional Court to interpret the Constitution in a way to reflect changes in what people want. "The Constitution is neither flawless nor eternal," the president said in a ceremony marking the 30th anniversary of the establishment of the court. "Interpretation of the Constitution too cannot be unchangeable or mistake-free. I believe interpretation of the Constitution ceaselessly evolves in accordance with the spirit of the age and how the people view the Constitution," he added. Moon's remarks come after his failed attempt to amend the Constitution. The government submitted its own constitutional amendment bill early in the year, but the opposition-led parliament failed to review the proposal, also failing to put the bill to a national vote in the local elections held June 13. The Constitution was last amended in 1987. 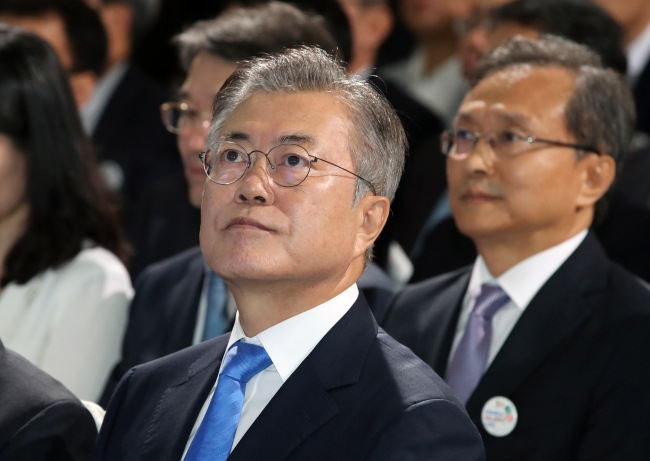 Moon earlier vowed to initiate as many changes as possible in various areas, including the way the government operates, as to implement as many and as significant changes as the government proposed constitutional revision sought to realize. The president has named a new chief justice of the Constitutional Court as the five-year tenure of the incumbent chief is set to expire next month. Four other justices of the nine-member court will also step down before the end of next month. Despite his call for changes to how the Constitution is interpreted, the president insisted that there are fundamental values, such as democracy and the dignity and rights of the people, that cannot be changed.